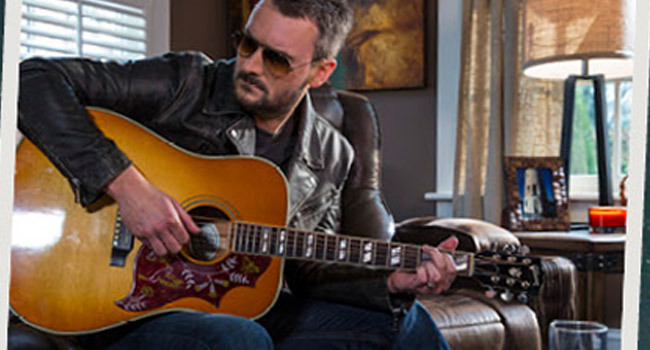 The Highway to Home Collection, an original furniture line created by Eric Church, is now available at RoomsToGo locations and additional select retail outlets. The collection was inspired by Church’s love of the road and exploration of the world combined with family traditions and the comforts that allow the most important adventures to happen…the ones in our homes. On Church’s 2006 debut album, Sinners Like Me, the man The Washington Post would later call “a born balladeer,” bore his worst fears in the lyrics of the autobiographical album cut, “What I Almost Was,” reminiscing, “Yeah, I moved on back home and came awful close / To being some son-in-law to some CEO / Coulda been a corner office, country club, suit and tie man / Answerin’ to no one but her and him.” It was an ode to the life he relinquished when choosing to pursue a career in music instead of claiming his role at the booming family furniture business in Granite Falls, N.C. Soon after his move to Music City, a certain Music Row publisher’s advice that he should “just pack it up and move back home” ultimately had the singer/songwriter questioning his decision. Church persevered, shortly thereafter landing a record deal proving the naysayer wrong. Three albums later he cemented his first of many No. 1 hits along with his first of seven GRAMMY nominations with his watershed release, Chief. But throughout that long journey from a man with a dream to one of today’s musical superstars, Church always stayed connected to his roots. His songs often reflected his upbringing and his observations of small town life in North Carolina. Traveling the world with his own family, he discovered the need to keep the sanctity of home was very important as home had always fed his art and grounded it in reality. Through this dichotomy, the idea for a venture that would combine his family’s history in the furniture business along with his touring enterprise was born. Highway to Home features four collections: Heartland Falls, Silverton Sound, Arrow Ridge and Hickory Canyon. Named after fictitious places that represent destinations along his journey, the collections range from a nostalgic mix of arts and crafts to urban-industrial to eclectic all with a touch of rock ‘n’ roll spirit. Highway to Home will include bedroom, dining room, occasional and upholstery pieces, as well as accent pieces that range from classic to those that are distinctly Church. Highway to Home is not a music-based collection, but instead, founded on the life experiences Church has gained as he travels from venue to venue. Just like Church’s music, the first four distinct collections of Highway to Home cannot be categorized into one style. Church has designated a portion of the proceeds from Highway to Home to be donated to JDRF through his Chief Cares foundation. JDRF is the leading global organization focused on type 1 diabetes research. Church, who has personal ties to diabetes through family members, is committed to combating this disease that strikes all ages. Highway to Home is available at select retailers nationwide.